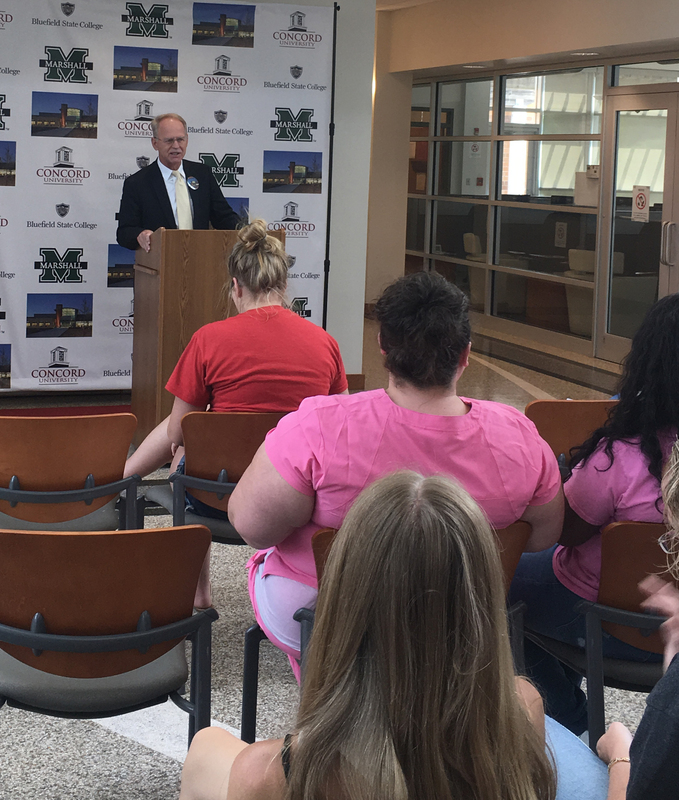 BEAVER, W.Va. – State officials, students, faculty and community members gathered at the Erma Byrd Higher Education Center on Friday to celebrate the tenth anniversary of the facility’s opening. The Erma Byrd Center, which was West Virginia’s first collaborative higher education campus, offers classes and student services from Bluefield State College, Concord University and Marshall University. During Friday’s celebration, a variety of state and college officials offered congratulations and celebratory remarks, including Dr. Dave Swanson, chair of the Higher Education Foundation; Dr. Paul L. Hill, Chancellor of the Higher Education Policy Commission (HEPC); Dr. Marsha Krotseng, President of Bluefield State College; Dr. Susan Williams, Beckley Director for Concord University; Ginny Painter, Senior Vice President for Communications and Marketing at Marshall University and Brian Aluise, field representative for Senator Joe Manchin III. Students attending the event were eligible to apply for more than $30,000 in scholarships. Bluefield State College, Concord University and the Higher Education Foundation each offered ten $1,000 scholarships in recognition of the ten-year anniversary. Also during the event, students and faculty were encouraged to submit items for a time capsule to be buried for the next ten years and re-opened on the Center’s 20th anniversary. The Erma Byrd Center is part of what has become the “Erma Byrd Higher Education Complex.” The Complex houses the Center, the West Virginia Higher Education Policy Commission Allied Health Wing and the main campus of New River Community and Technical College. For the spring 2017 semester, more than 1,100 students were enrolled at the Complex, which offers degree programs from multiple higher education institutions in a variety of fields. The Center is managed by the West Virginia Higher Education Policy Commission. For more information about the programs, classes and resources offered at the center, visit www.concord.edu/ermabyrd.